635. 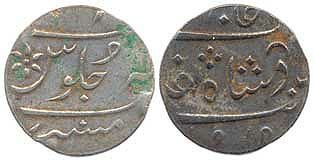 Colonial coinage, Silver, Uma Rupia, AD 1912, 11.8 gms (KM# 18). 636. 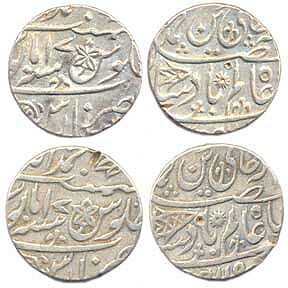 EIC, Awadh, Silver Rupee in the name of Shah Alam II, Qita Bareilly, with initial waw, AH x/37 11.2 gms (KM# 52.3). The letter Waw on EIC issues was reputedly the initial of the family name of the new settlement officer for Bareli, Henry Wellesley. 642. 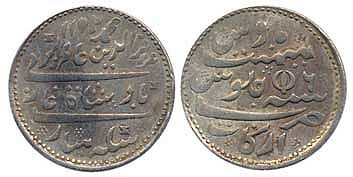 EIC, Bombay Presidency, Silver Rupee in the name of Shah Alam, Malabar Coast or old Mumbai, mint mark-inverted crescent, plain edge, 11.7 gms. (KM# C640). 643. 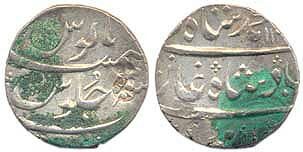 EIC, Bombay Presidency, Silver Rupee in the name of Muhammad Shah, Mumbai, AH 113x/x, 11.7 gms (KM# 436.45). 644. 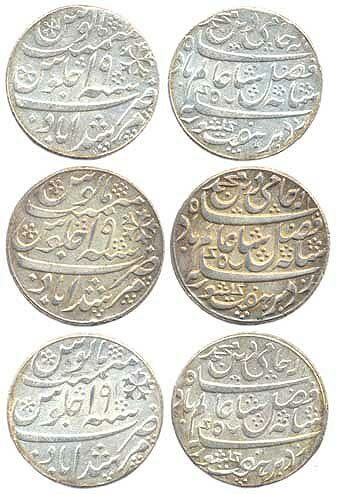 EIC, Bombay Presidency, in the name of Shah Alam II, Surat, straight milling, struck at Calcutta AH x/46, 11.6 gms. 647. 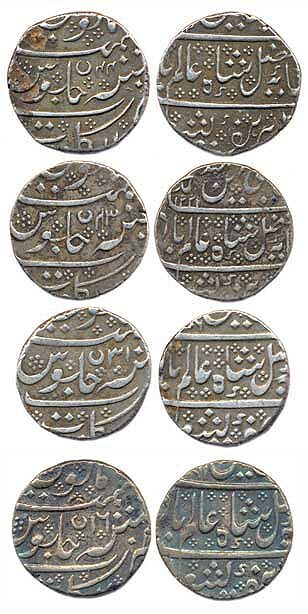 EIC, Madras Presidency, Silver Rupee in the name of Alamgir II, Arcot, struck at Madras, indented cord milling, open lotus, 11.8 gms (KM# 410). 648. 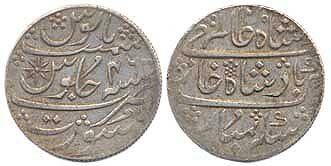 EIC, Madras Presidency, Silver Rupee in the name of Alamgir II, Arkat, struck at Calcutta, AH 1172/6, mint mark rose, 11.8 gms (KM# 427). 649. 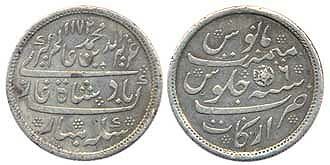 EIC, Madras Presidency, Silver Rupee, ¼ Pagoda, value in English & Persian on buckled garter, 10.7 gms. (KM# 352) about very fine. 650. EIC, Madras Presidency, Copper cash, Pagoda series, Salem, crossed lines with date AH 1212/ 1797-98 AD, 1.4 gms (KM# 312), very fine. 651. EIC, Madras Presidency, Copper cash, bale mark, AH 1212, 1.1gms, (KM# C407), fine.